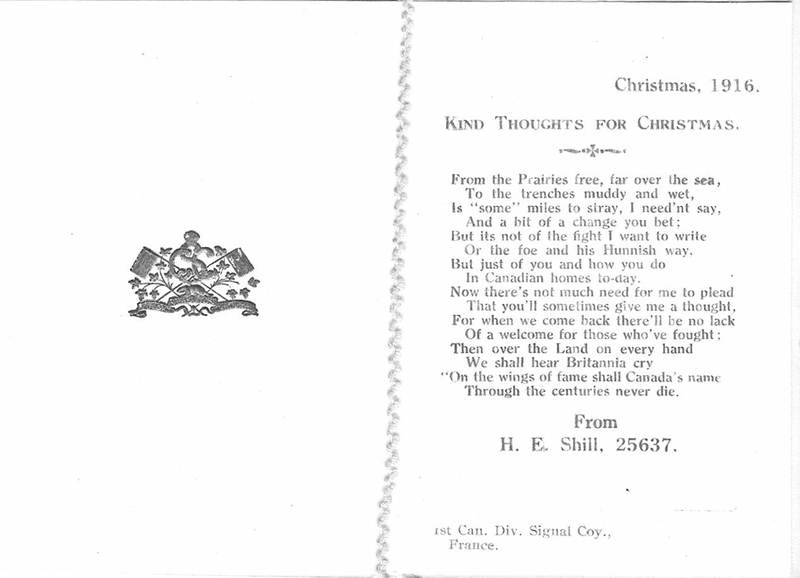 Christmas would likely have been a time when soldiers wished they were home with their loved ones. 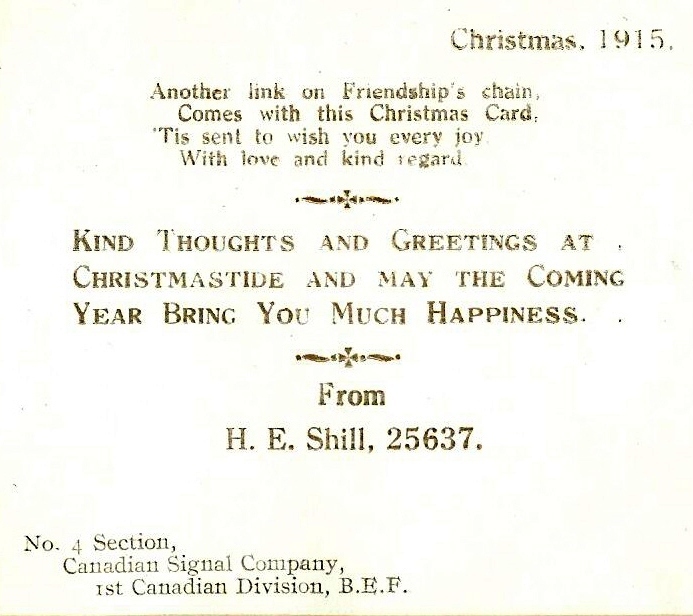 While Bert Shill was away at the front with the 1st Division Signal Company in 1915 and 1916, he sent Christmas Greetings to his family back in Montreal. They would have been unaware of his whereabouts, other than to know he was in France. At the end of October 1915, Bert was "in the field" and took a 7-day leave. The 1st Canadian Signal Company was based in Saint-Jans Cappel, France, near the border with Belgium. Work was proceeding on a new signal office at Westhof while telephone lines were being installed between Westhof and English Farm. The weather was wet and rainy - little work was done on Christmas day. War diaries - 1st Canadian Divisional Signal Company can be found here. Shortly before Christmas, 1916 (Dec. 14), Bert was promoted to Acting Corporal with pay. The 1st Canadian Division Signal Company had been based in Camblain L'Abbe, France, a short 12 kms from where Bert would die in September the next year. The Company moved to Bruay where the men were mostly billeted in local houses. The showery weather let up on Christmas day and was clear and windy with little work being done. The cookhouse was in bad condition and unable to prepare a dinner for the men.